Goa beaches are principally categorized into two areas north and south Goa beaches, keeping in mind the geographical locality. North Goa beaches include beaches such as Candolim beach, Sinquerim beach, Baga beach, Bambolim beach, Arambol beach, Vagator beach etc where as South Goa beaches include beaches such as Agonda beach, Benaulim beach, Palolem beach, Movor and Cavelossim beach. It is believed that North Goa beaches are hot and happening with a cosmopolitan crowd thronging the beaches whereas South Goa beaches are peaceful and silent and are considered to be a perfect place for a great vacation. Anjuna beach finds equal favor amongst all kinds of crowds, be it a group of overlanders, monks, defiant ex-hippies, artists, seers, researchers or just someone looking for a place to rejuvenate. The place has life and enthusiasm written in its air. The all night long beach parties, the Christmas to New Year frenzy or the swanky full moon parties, Anjuna is always up for it. On a day trip to Anjuna you can savor the best delights at the famous flea market or the shopping hangout off the beach or else you can enjoy the easy strolls on a moonlit night on the cool silvery sands. 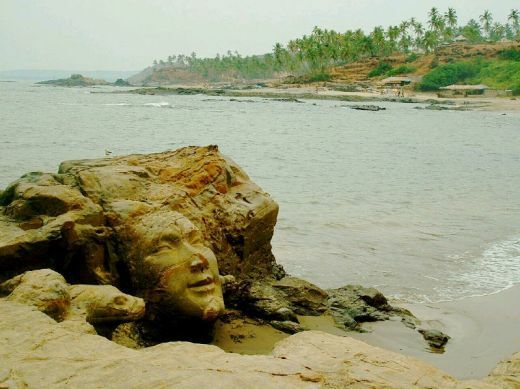 8-km west of Mapusa, Anjuna is one of the most popular beaches in Goa. The sea is calm so you can enjoy swimming or enjoy the allure of sunset from any of the beach resorts’ balcony. Enjoy the funky music and loud beach parties that are a fixture of Anjuna. For the gourmets Anjuna offers the best of western seafood. You can choose from amongst any of the beachfront or village hotels. All of them are equally simple and serve equally delighting food and chilled beer. The best bets are the semi open-air, thatched palm leaf affairs, specializing in fish and western food. The beach also offers fresh fruit buys such as watermelons, pineapples and locally grown coconuts. Baga beach is quite a hit with western tourists who love its water sports and fishing expeditions. Baga has the best restaurants in Goa. From standard beach shacks to rustling pizzerias and terrace cafes serving real espresso coffee, Baga has all types of foodie destinations. You can get a romantic candlelit dinner at the beachside to a traditional Goan meal at the shacks and restaurants. Baga offers one of the most swanky and exotic nightlife in whole of Goa. The Church of St John the Baptist atop a hill overlooks the beach. It is a worth visiting place in Benaulim. To commemorate the movement of St John in his mother’s womb when he was in his mother’s womb and visited by Mary, the mother of Jesus, the young men of this village jump in the wells. It is a foodie’s destination for those who are willing to experiment with culinary delights of the seafood. The flat-bottomed valley lined with coconut trees and redbrick huts would be even more picturesque were it not for the monstrous multi-storey edifice perched above it. Now the Oberoi’s have erected a huge & famous five star hotel here,making it a hub for tourists but one can also manage in shoestring budget, by occupying the Cheap hotels or guesthouses available at Bogmalo beach. This beach is a heaven for fishing lovers,as here they can indulge into a favourite pastime.one can also opt for swimming,as this beach is safe for swimming.After indulging all the favourite activities one can taste some delicious Goan cuisine, accompanied by the ever-famous Goan drink Feni, offered at numerous eating joints out there. Colva is not one of the traditionally known beaches of Goa. As compared to other popular destinations it is a more recent discovery. But whatever it may be it is 20-km long bliss of virgin white sands, palm fringed,and sun beaches. 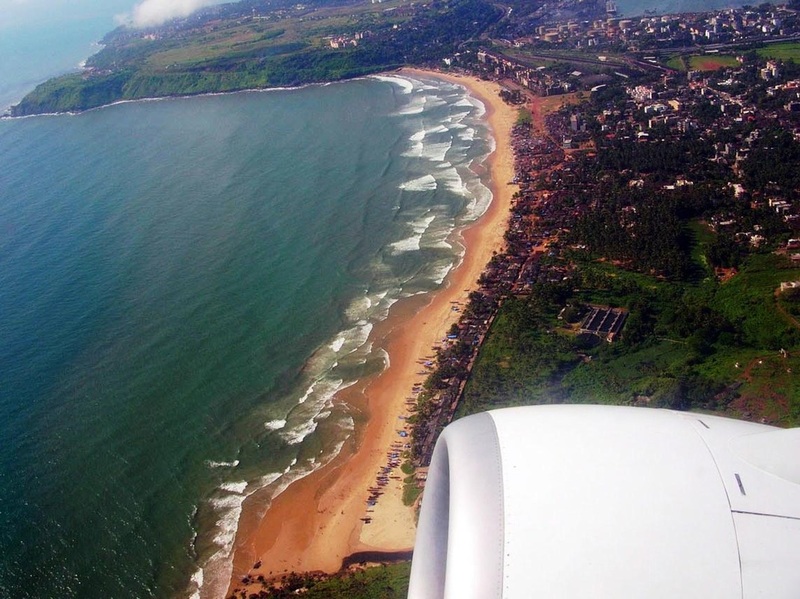 Undoubtedly, Colva is the most popular beach of Goa. Off lately, the quiet life of Colva has been punctuated by the number of hotels and buildings that have come up here in quick succession of one another. The annual religious event of Fama of Menino Jesuse (Child Jesus) is held at the church in Colva since the 17th century. 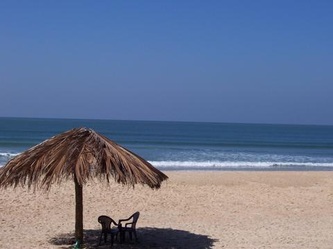 You can savor a quiet stroll on the silvery sands of the Colva Beach on a moonlit night or a sunbath on the golden sands of Colva on sunny morning. That certainly makes your stay at Colva an utterly romantic experience. 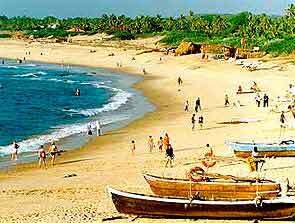 As a part of a 30 km stretch, of beach coastline along the Arabian Sea, that begins at Fort Aguada and ends at Chapora Beach, Candolim is a North Goan beach, which makes it the first beach that can be approached from the city of Panaji. Candolim, experiences a mixed croud,be it a group of youngsters, monks, artists, seers, researchers or just someone, but all of them are looking for a place to rejuvenate and relax themselves from the increasing tensions and frustrations of life. This place has joy and happiness mixed in its air.The most basic attraction-Aquda fort & calangute beach are the most worth visiting places.The best bets available here are Fishing, enjoying Water Sports-like, Parasailing and Water skiing. Organizing a Beach Excursion is a also a good idea. Besides Dona Paula itself there are Miramir beach, which lies 4-km north of Dona Paula, and the Vainguinim Beach, which is situated 1-km west of the beach side. The National Oceanographic Institute was set up to study the diverse marine biology. The major attraction of the institute is its Marine Biology Museum and Taxonomy Reference Center. The Choro Island along the Mandovi River, about 9-km from Dona Paula beach, has exotic Salim Ali bird sanctuary, which is a mangrove forest. It is a site for local and migratory birds throughout the year, making it a bird watcher's paradise. Reis Magos Church on the Dona Paula beachside is one of the oldest churches built in Goa. It is dedicated to the three Magi (the wise men of the East) You can indulge in a complete shopping spree at Dona Paula.From straw hats, lace kerchief to spices, feni and port wine to Indian handicrafts and jewelry. Miramar Beach-Lying against the estuary of the river Mandovi,it is just 3 km from Panaji in the north of the state and a km away from Dona Paula. Also known as, Gaspar Dias,it is a lovely golden beach of soft sand,occupied by a thick grove of shady palms, facing the blue Arabian Sea and forming a dense canopy over the area. As the word 'Miramar' in Portuguese, means, the viewing of the sea, so one can have a panoramic view of the sea, and the Aguada fort just across the Mandovi River. The most captivating, view is created ,when this 2 km long coast of fine , soft & silvery sand bed sparkles in the moonlight.It provides the much-desired solitude & isolation, for those who want a few moments of life away from the crazy crowd of the city,as it is not too much crowded.Its good location, peaceful & quiet atmosphere makes it an ideal place for walksThis place provides to many migratory birds, like, Plovers and Gulls. so this beach is a favorite amongst human beings as well as birds. The beach experiences a mixed croud of locals and tourists alike on most days and the tourists find all the facilities within the vicinity of Miramar Beach as, various beach resorts and hotels are present, on the Miramar Beach itself.One can enjoy shopping, sightseeing, tourist destinations and even the festive hue of the local,Konkani fishermen. There are also other activities that occupy one’s entertainment list. Dhempe College of Arts and Science & the memorial to Goa's first chief minister,are other places worth a visit.This beach makes one forget all the problems of life & teaches one to enjoy the each & every moment of it. Arrival in Delhi and proceed for sightseeing. One night stay at hotel. Leave for Goa. Arrive at Goa and transfer to the hotel. The afternoon is at leisure. One night stay at hotel. After breakfast, proceed on a half day sight-seeing tour of Goa, visiting Miramar beach, Basilica of Bom Jesus and the City of Panjim - bustling with shops and tourists. The afternoon is at leisure to relax on the beach. One night stay at hotel.